Experience Take That like never before, with a Hospitality concert package at Anfield. Our exclusive Hospitality packages offer you the best seats in the house, teamed with delicious food and the world famous Anfield Hospitality, promising you a once-in-a-lifetime experience. Our Gold Hospitality package includes a premium concert seat with fantastic views of the stage. You’ll also receive a drink on arrival at your designated lounge, as well as access to a range of delicious selection of hot and cold food, all meals freshly prepared on site by our Anfield Chefs. After the concert you’ll have the chance to return to your lounge to continue your evening with post show entertainment from a live DJ or band. Our Platinum Hospitality package includes a premium concert seat with fantastic views of the stage. You’ll also receive a drink on arrival at your designated lounge, before being seated for an exclusive 3 course meal freshly prepared on site by our Anfield Chefs. Our Platinum Package also gives you inclusive beer wine and soft drinks up until the main act commences on stage. After the concert you’ll have the chance to return to your lounge to continue your evening with post show entertainment from a live DJ or band. Our Diamond Hospitality package includes a premium concert seat with fantastic views of the stage. You’ll be welcomed to your designated lounge with an arrival drink before being shown to your table. Here, you’ll experience Anfield Hospitality at its finest with an all-inclusive food and beverage package until the main act commences on stage. After the concert you’ll have the chance to return to your lounge where a delicious hot and cold food will be available for you, as well as post show entertainment from a live DJ or band so that you can continue your evening in style. Our Diamond Hospitality Box package includes a premium concert seat with fantastic views of the stage. You’ll be welcomed to your designated box with an arrival drink before being shown to your table. Here, you’ll experience Anfield Hospitality at its finest with an all-inclusive food and beverage package for the duration of the Concert. After the concert you’ll have the chance to return to your box where a delicious buffet will be available for you. Our VIP Box package includes a premium concert seat with fantastic views of the stage. 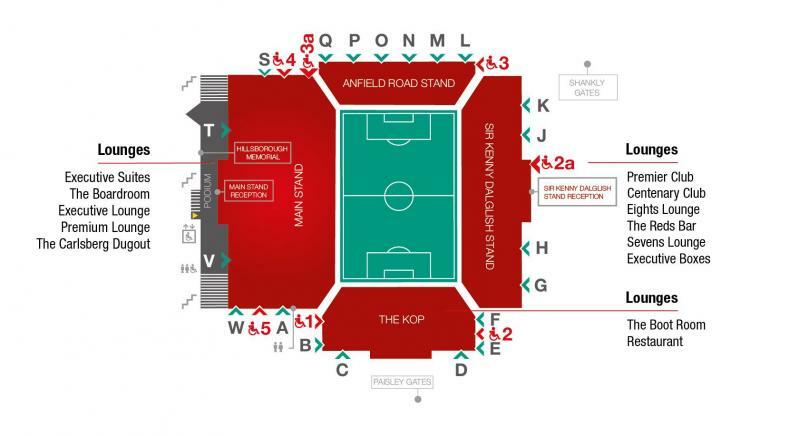 You’ll also receive a drink on arrival at your designated box, before being seated for an exclusive 3 course buffet, freshly prepared on site by our Anfield Chefs. This package also gives you access to beer wine and soft drinks up until the main act commences on stage.